Find the lowest prices for English Language Courses in Ireland! Are you looking for english language schools in Ireland or a english summer school in Ireland? How about study english in Ireland or language courses for adults in Ireland? Whatever type of english course you are looking for, Languagebookings.com will help you find it—and at the lowest possible price! Browse over many English schools in many locations in Ireland until you find the english course and school that is right for you. We make it easy to find discount prices at the most popular schools in Ireland and we provide detailed school information, photos, videos and students reviews for a great variety of English schools in Ireland. Choose Languagebookings.com for all your courses reservations, and see why more and more students are choosing us to study english language in Ireland! Why Learn English courses in Ireland? If you are playing around with the idea of taking English courses in Ireland, it is a good idea that you do. Not only will you learn impeccable English in Ireland, you will be surrounded by fellow students with the same mission as you. English courses in Ireland will improve your office skills business skills and general English speaking skills. When taking English courses in Ireland, you will soon realize that each and every one of the classes is taught by a certified, trained native English speaker who has years of experience behind him or her. General English courses in Ireland are offered for people who want to improve their knowledge of grammar, confidence and language skills. In order to help assist people attain excellent results, there are available courses on English Exam Preparations for anyone interested in scoring well in these tests. On the other hand, English courses in Ireland with special purposes are also available for people who want to improve their ability to speak English, especially for professionals, technicians, specialists and academics. People who need English language skill development, there are executive courses for learning the English language you can take. Kids and younger adults will also enjoy the Junior English Courses offered. Many students decide to take English courses Ireland when they realize that the atmosphere of every class is relaxed, easy and totally conducive to learning a new language. Students are considered as clients and receive efficient encouragement and guidance every step of the way. 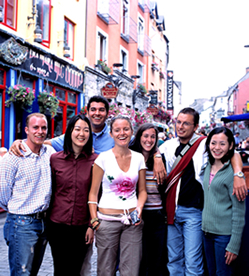 With various international students taking the same courses being offered in schools and institutions offering English courses Ireland, you will be sure to make new friends from around the world without a doubt. New, useful contacts are going to be the result of taking English courses Ireland. As you immerse yourself in English courses in Ireland, you can also enjoy seeing a few attractions including “An Evening of Fairies, Folklore and Food” which is a lot of music and storytelling along with an Irish dinner in the oldest Pub of Dublin, called The Brazen Head. Called “Dinners Theaters,” students can also go see Kilmainham Gaol Historic which is a historic old jailcell in the nineteenth century known for the way they harshly treated prisoners. English courses Ireland will also give you easy access to Secret Castle of magic is full of Vampires and Magic as guests explore bridges and tunnels within the castle including a haunted library and a gargoyle courtyard. There is also a graveyard with Bram Stoker’s history for you to frightfully enjoy. St Michans Church is a point of interest and landmark architectural building which is part of a religious site tour you can enjoy as you study English courses Ireland. Many Pubs around Ireland host traditional nightly Irish dancing show with authentic music. They features bands, the pub owners and a lot of happy clients in Ireland City Center’s outskirts. You can learn English ‘after hours’ as you attend daily classes in your English course Ireland.